The composition of the flu vaccine is an educated prediction. Even though the vaccine may not target the transformed influenza virus, it will still prime your immune system and help reduce symptoms. When most people think of St. Jude Children’s Research Hospital, flu isn’t the first thing that comes to mind. But it’s here, in the heart of Memphis, where world-class influenza research has occurred since Robert Webster, PhD, began the influenza program at St. Jude. Today, research labs led by Richard Webby, PhD, perform influenza surveillance, whole-genome sequencing, and inform vaccine composition. Since becoming a Collaborating Center for the World Health Organization (WHO), our center focuses on the human-animal interface of influenza infections — the source of influenza pandemics. The World Health Organization hosts an Influenza vaccine composition meeting (VCM) biannually, where influenza experts from around the world to summarize data on animal flus infecting humans and determine the most effective combination of influenza strains to include in the annual flu vaccine. Our lab plays a key role in sequencing influenza isolates, antigenic characterization, and phylogenetic analyses — particularly of these animal viruses — used during these WHO meetings. Using sequence data and antigenic characterization, we compare currently circulating flu strains to previous vaccine strains to predict how each strain will respond to the current vaccine. The VCM occurs in February for the northern hemisphere and again in September for the southern hemisphere. 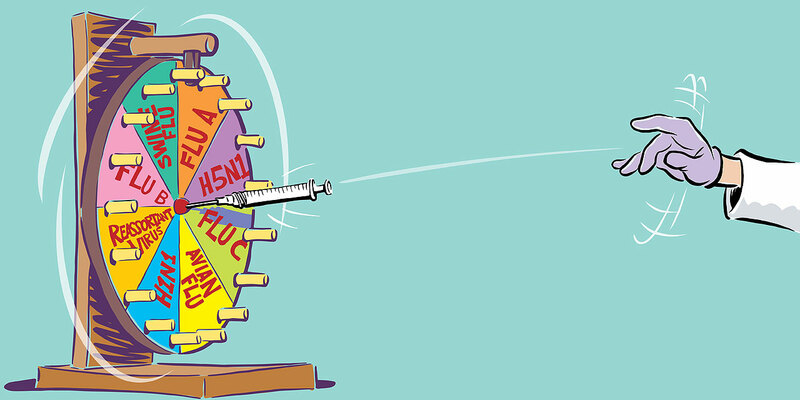 In order to allow vaccine manufacturers enough time to produce, test, and distribute vaccines globally, there is at least a six-month-lag period between selecting flu strains and the general release of the vaccine. Here’s why this is a problem for scientists. Influenza viruses are very prone to making mistakes during replication. This process, called antigenic drift, can produce a virus with enough antigenic diversity that the original vaccine may only offer limited protection against flu infection. Antigenic shift is another process whereby a flu virus can acquire antigenic diversity. This process occurs when two different influenza strains infect the same cell. During replication, the viruses can swap gene segments leading to an entirely new progeny virus, called a reassortant virus. In addition to lag time, antigenic drift and shift create viruses the vaccine isn’t really targeted to treat. This way, the viruses “outsmart” the vaccine. Imagine trying to play a game of darts where you’re forced to throw the dart in February and expected to hit the bullseye in September/October. My answer is always that some protection is better than none. Even if the vaccine is expected to have diminished effectiveness, it can still prime your immune system and help reduce symptoms if you do get infected. Possibly more importantly, reducing the influenza burden in the general population helps prevent transmission to others. Meaning, the more people that get the vaccine, the less virus is present to circulate. My research focus is on swine influenza. Specifically, the host-species barrier that typically prevents swine flu viruses from infecting humans. Much research effort has gone into determining what prevents highly pathogenic flu viruses, such as H5N1 “bird flu,” from infecting humans directly. But comparatively, much less is known about the barriers preventing swine flu viruses from transmitting to humans. The 2009 H1N1 pandemic was a unique circumstance where a swine flu virus emerged with the ability to not only infect humans, but transmit human-to-human. Subsequent sequencing analysis determined the genetic composition of these viruses, and many of the molecular markers previously identified in pandemic viruses were not present. This raised an interesting research question to me: “What caused this virus to emerge from swine and directly infect humans?” Much of the focus of my doctoral dissertation has been determining what made these viruses unique. We have identified a subset of swine viruses that have been introduced from humans back into swine, a process called reverse zoonosis. These viruses appear to acquire a handful of genetic mutations that cause a lack of fitness in human hosts. We identified replication differences when these viruses were grown in human cell culture versus swine cell culture. The swine viruses exhibited a lower replication fitness when grown in human cells as compared to swine cells. These mutations, combined with the changes initially acquired by these pandemic viruses, give us a glimpse at which amino acid residues might be key in initiating a pandemic. Part of our lab’s focus on influenza surveillance sequencing helps us identify these key amino acid changes in hosts all around the world. It is our hope that one day identifying a virus with pandemic potential will allow us to develop vaccines quickly enough to prevent the pandemic entirely. Daniel Darnell is a doctoral student in the department of Infectious Diseases.